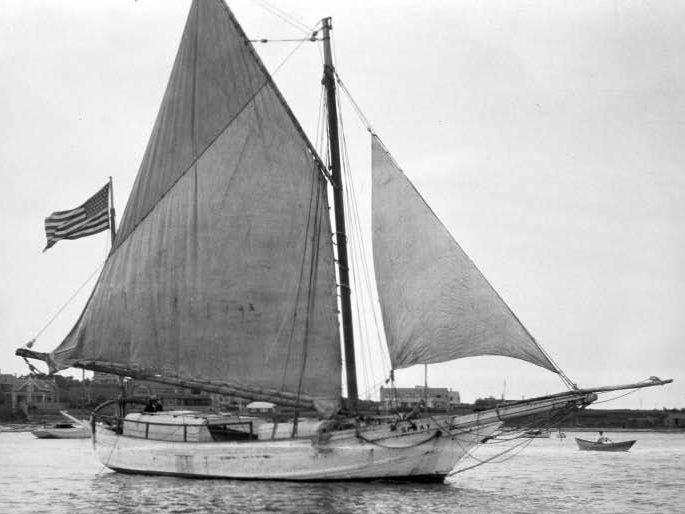 I had resolved on a voyage around the world, and as the wind on the morning of April 24, 1895 was fair, at noon I weighed anchor, set sail, and filled away from Boston, where the Spray had been moored snugly all winter. The twelve o'clock whistles were blowing just as the sloop shot ahead under full sail. A short board was made up the harbor on the port tack, then coming about she stood to seaward, with her boom well off to port, and swung past the ferries with lively heels. A photographer on the outer pier of East Boston got a picture of her as she swept by, her flag at the peak throwing her folds clear. A thrilling pulse beat high in me. My step was light on deck in the crisp air. I felt there could be no turning back, and that I was engaging in an adventure the meaning of which I thoroughly understood. Slocum navigated without a chronometer, instead relying on the traditional method of dead reckoning for longitude, which required only a cheap tin clock for approximate time, and noon-sun sights for latitude. On one long passage in the Pacific, Slocum also famously shot a lunar distance observation, decades after these observations had ceased to be commonly employed, which allowed him to check his longitude independently. However, Slocum's primary method for finding longitude was still dead reckoning; he recorded only one lunar observation during the entire circumnavigation. Slocum normally sailed the Spray without touching the helm. Due to the length of the sail plan relative to the hull, and the long keel, the Spray was capable of self-steering, and he balanced it stably on any course relative to the wind by adjusting or reefing the sails and by lashing the helm fast. He sailed 2,000 miles west across the Pacific without once touching the helm. At last she reached port in safety, and there at 1 a.m. on June 27, 1898, cast anchor, after the cruise of more than forty-six thousand miles round the world, during an absence of three years and two months, with two days over for coming.